Last week on Top Chef the challenge was to make something using the classic ingredients chicken, onions and potatoes. It was a great show...very interesting to see what the contestants decided to make. The two best dishes came from the people who did more classic French preparations. The professors at the French Culinary Institute in NY were judging them, after all. Now, I can cook a mean roasted chicken (Thanks Nigella! 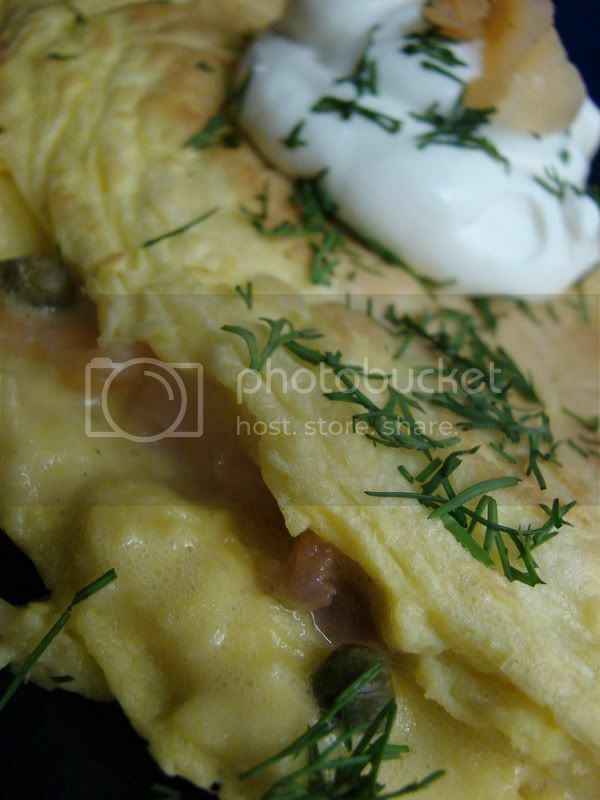 ), but I've never really attempted an omelet. I made scrambled eggs all the time when I was a kid, with all kinds of crazy leftovers added in. As an adult, I really don't eat a lot of eggs. So, this weekend I decided I needed to learn to make an omelet. Jack offered to teach me, and we made a night of it. 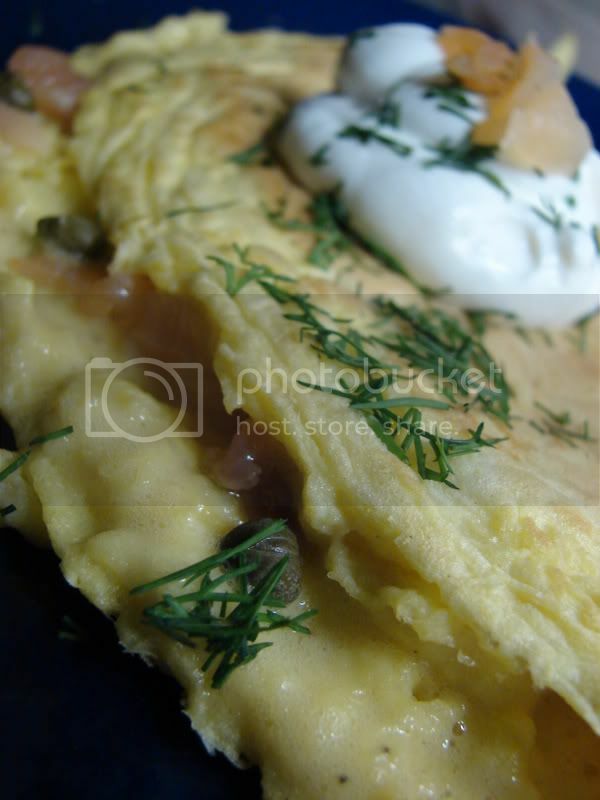 Jack's omelet skills, while not exactly the proper classic French trained type, are very good. 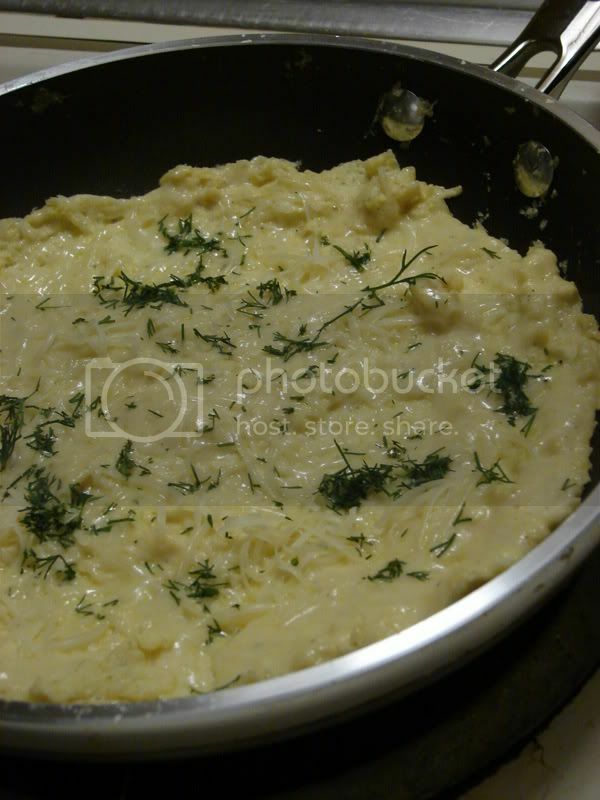 We had to go buy an omelet pan, a good non-stick, 10-inch fella with gently sloping sides and a heavy feel. We scrambled 3 eggs up in a plastic cup with the hand-held blender until it was slightly frothy. Then Jack poured it into the buttered hot pan and swirled and pushed and swirled and pushed....I'm sorry, I don't think I can write instructions on how it's done. It's hard to explain. Easy to do, though. Apparently, Julia Child uses up 13 pages of Mastering the Art of French Cooking to describe how to cook an omelet! Anyway, he showed me how to do everything, and then I took over and made my very own! 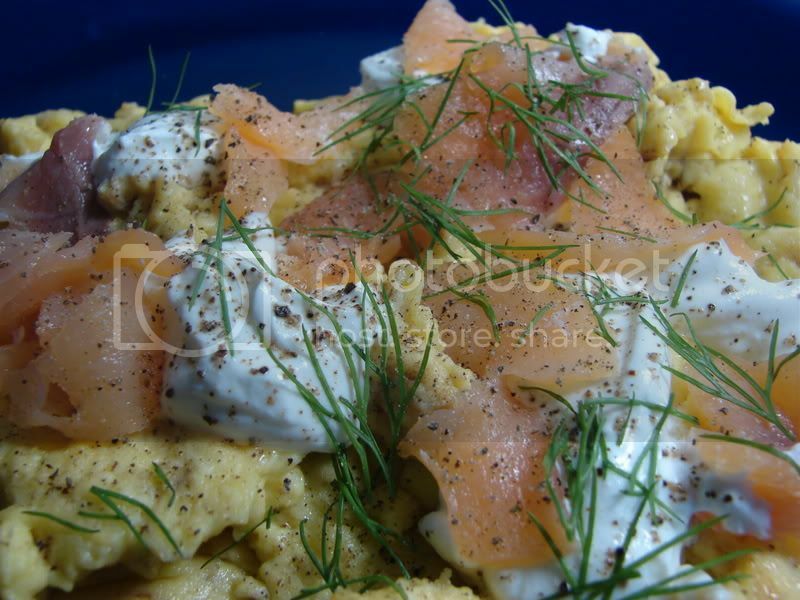 I filled it with smoked salmon and capers then topped it with sour cream and fresh dill. It was heavenly, and quite good for my first try. Good color on the outside, tender in the middle, fluffy, well seasoned. yay! I did it! His was topped had Gruyere cheese and fresh dill...a suprisingly good combo! DANG that looks good! I can't make an omelet. I always accidentally brown the eggs. Great job Steph! Not only does it look good, but I am sure it tasted wonderful as well. What's next on the ingredient list? 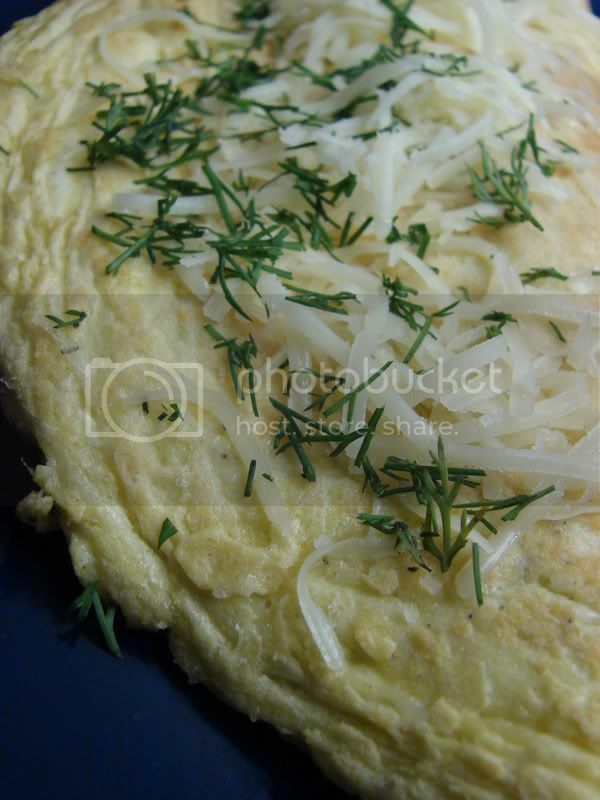 There is a Denver omelette, what about a St. Louis? Keep Cooking.